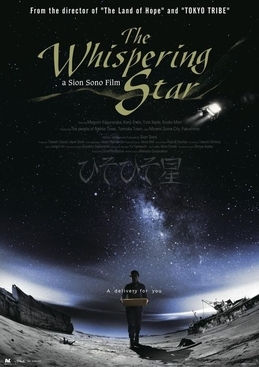 Sion Sono’s minimalist science fiction drama begins with a statement that humans have caused devastation across the universe and now with most of them dead the universe is a much better place. 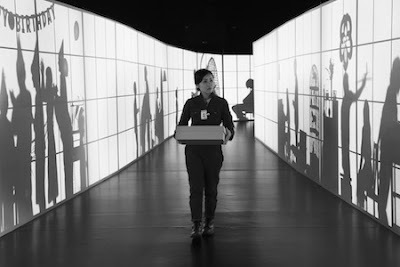 The film then follows the day to day existence of robotic delivery woman who travels the universe delivering packages to people and A.I. robots across the galaxy. A minimalist art house sort of film this is a film that is going to be a tough haul for people expecting Sono’s wild and crazy style of film making. Meditative film some on the order of Samuel Beckett, Andre Tarkovsky or other Eastern European masters the film is full of long takes and lengthy silences. Dialog when we get it is elliptical and oblique. This is a film you have to commit to and go with or else you the film will bore you. The film is an obvious mediation on Fukishima and the devastation left in its wake having been filmed in the devastated areas, the film makes you ponder what makes us human and what we are doing to the world around us. I’m not sure what to say about the film. I think the film is a masterpiece. A brilliant change of pace for a master filmmaker. It is the equal of Tarkovsky’s films like STALKER, SOLARIS or THE SACRIFICE as well as other art house science fiction films. It’s a film that deserves a full on write up away from the crush of Japan Cuts. If you love head trip scifi and don’t mind deliberate pacing see this film.